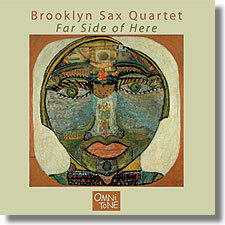 Fusing classic modern American jazz with newer sounds and rhythms drawn on African and Asian influences, the Brooklyn Sax Quartet explores works by co-leaders David Bindman and Fred Ho, melding the sounds that teem through the "far side of here." Besides featuring wide ranging original compositions by Bindman and Ho — including Ho's dynamic Black Nation Suite and a hip arrangement of "A Night in Tunisia" in 5/4 — this recording is dedicated to and includes some of the the last recordings of a founding member of the BSQ, the late alto saxophonist Sam Furnace. Buy Far Side of Here now at the OmniTone store. Click below on MP3 or WMA to hear one-minute sound samples.